These days it can be difficult to go grocery shopping without falling prey to the countless snacks and finger foods lining the isles. This can make it hard to cut out or reduce processed foods, especially when those cool ranch Doritos are currently on sale! While giving in once in a blue-moon, and treating yourself to a bag of processed junk is not the end of the world, what if I told you there was an easy and healthier way to satisfy your chip craving!? Baked homemade pita chips are the go-to ‘chip’ in our house when a craving for something crunchy and salty hits.These healthy oven baked chips also double as a great after school snack when served with some crudites! The great thing about these healthy pita chips is that the flavoring is entirely up to you! As long as you keep a basic list of spices in your kitchen pantry, you can re-create almost all of the ‘store bought’ flavors yourself. Looking for something even heartier as a snack? Dip your oven baked pita chips in some garlic hummus,or a homemade tomato salsa! Pita chips and hummus are a personal favorite of mine! 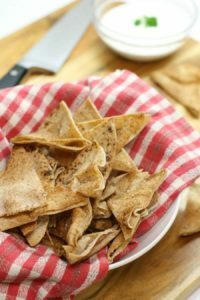 If you want to make these baked homemade pita chips as healthy as possible, consider making your own pita bread from scratch at home! Otherwise simply buy a bag or two of pita bread (whole wheat or white is fine, its just a taste preference) at the store. The pita can be frozen in bulk, (before being turned into chips) for use in other recipes. I add grilled pita bread brushed with garlic butter as a side to lasagna to cut out the carb heavy white bread. After you’ve chosen your pita bread, simply cut it into wedges using a sharp chefs knife. It’s easiest to cut into 1/8ths but you could easily cut strips or large squares depending on your mood! Pre heat your oven to 375F and if using butter( olive or coconut oil may also be used) melt it now. Clarified butter is ideal for making these homemade pita chips, as it adds a hint of flavor besides any other seasonings you might choose..
Lay the cut pita chips on a parchment or Silpat(affiliate) lined sheet pan and brush both sides with the butter or oil. This is where the fun begins! At this point in your snack prep you can decide if you want flavoured chips, or plain baked pita chips. 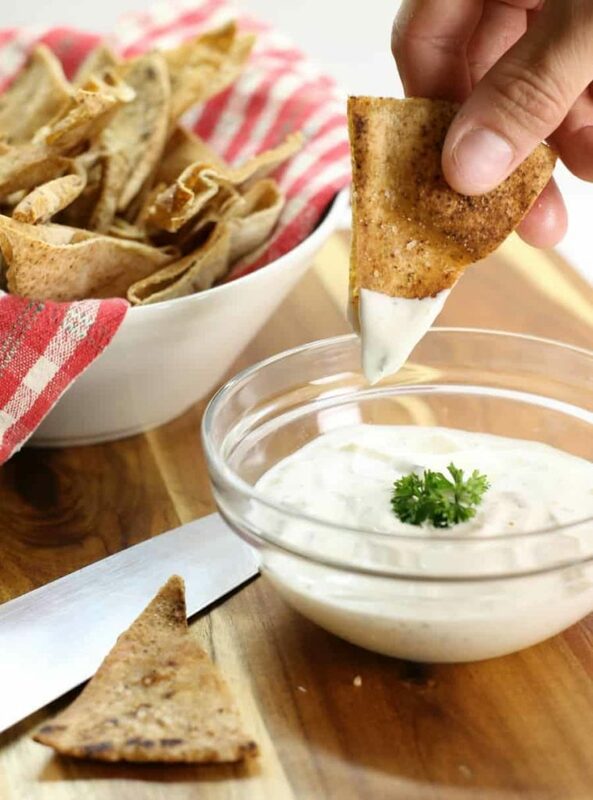 If you plan on eating these homemade pita chips withput a dip or salasa of sone kind, you can use one of the following seasoning mixes to spice up this easy homemade snack. Simple sprinkle the spice mix of your choice on the cut up and greased pita chips. The fat will help the seasoning stick to the baked chips and also help crisp them up. Try these popular seasonings, or create your own! Sprinkle the seasoning mix on the pita chips and place in a pre-heated 350F oven for 10 minutes. Once the baked pita chips start to darken, take them out, and let them cool! They are now ready to eat. Serve them to your kids as a healthy after school snack with hummus and vegetable sticks, or indulge in them yourself, with a creamy tzatziki dip or salsa! 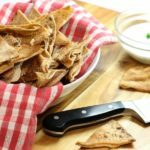 Homemade pita chips are an easy and healthy snack great for after school or simply when a chip craving hits. Serve with hummus or homemade salsa! 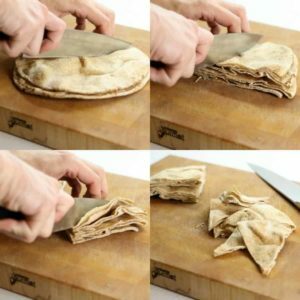 Lay out the cut up pita bread on a parchment or silpat lined sheetpan. Brush the pita bread with the clarified butter or oil. Sprinkle your seasoning of choice over the chips. Bake the homemade pita chips at 350F for 10 minutes or until they start to brown. 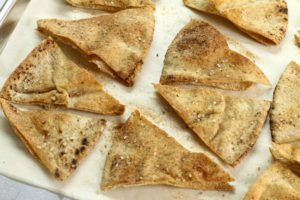 Customize the flavoring of these homemade oven baked pita chips by creating your own spice mix or using one of the mixes listed above! These homemade pita chips will be a great recipe for everyone’s repertoire and I love that you provided several seasoning options. I am sure they are quite addictive – I may have to try each variation! Thank you for the inspiration. Let me know how they turn out for you and if you create your own spice mixes! Homemade pita chips are seriously the best. I mean, any time I can season a snack the way I want to season it is a good time. I love that you’ve included several seasonings. I haven’t made these in years, but I went the Ranch route. They were so good! Thanks for the reminder — I need to make these again. I hadn’t made them in a while either( trying to cut out more wheat products yada yada(that was a fail by the way)) but I’m glad I made them again! They are so delicious and as long as you don’t binge eat them every day it’s all good! Yes! I love pits chips! A little healthy, and totally customizable like these with Cajun seasoning! A great snack and school lunch worthy!! The cajun version is one of my favorites..paired with a good salsa, it’s always a winner! Love this, it’s so simple and way healthier version than the “usual” fried tortillas. A great way to enjoy any dips for sure!